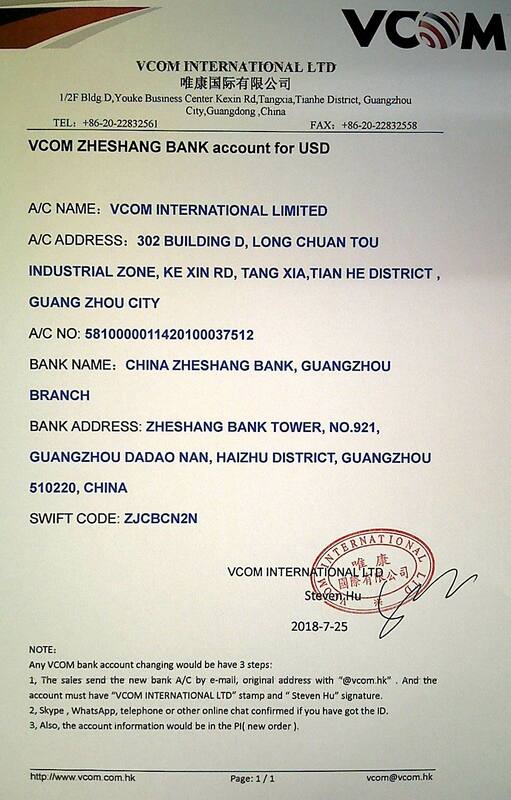 There are two payment methods for the VCOM online Mall: Paypal and Wire Transfer. First, you need to have a Paypal account. After that, you select “Paypal” in the payment method of the order. Finally, payment will be transferred to the VCOM Paypal account directly. Step 1: Choose “Wire Transfer ” and click “Submit Order” when you make an order. Step 2: VCOM Wire Transfer Account Information is below, please print or write down the payment information and make payment in your banks. Step 3: Go to your local bank to transfer payment. Please bring a printed copy of your Bank Transfer Information “Receipt”. Normally, payment will be received within 3-4 work days. Step 5: After payment finished, please back to your order centre on www.vcom.hk. Finding the "Already Paid" of the order and click it to finish the payment. * Please ensure the above bank account details have been filled in on your bank transfer form. * Contact VCOM B2R Customer Service Center if your payment is not confirmed within 5 days after making payment. included in your total payment amount. The bank transfer fee varies and is set by your local bank (remitting bank).